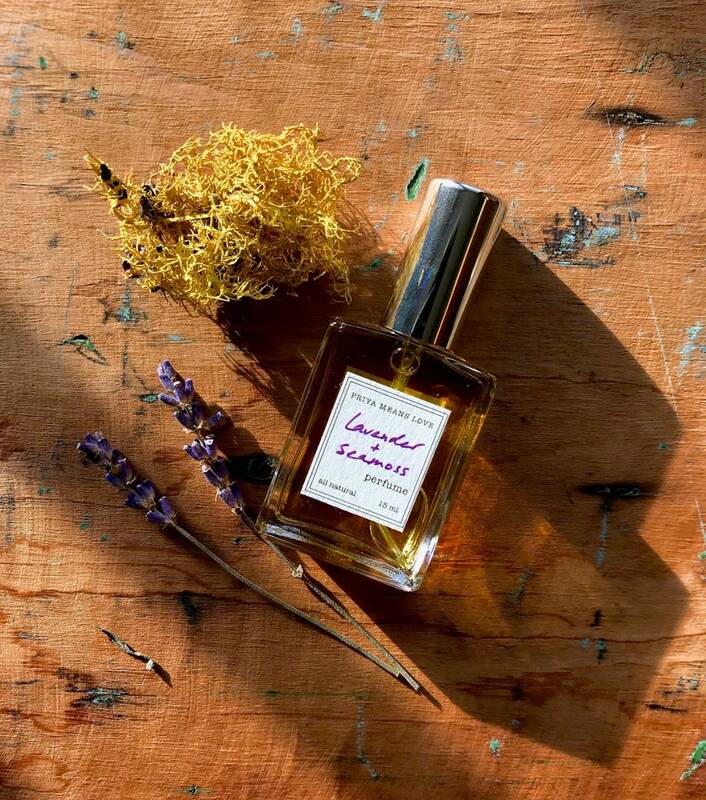 A scent of spring awakening the ferns and flowers of the forest floor, lit by sunlight, cool and fresh—a drift of clean lavender mingles with earthy, salty oakmoss. 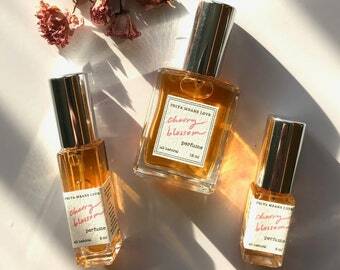 This perfume is a 'fougere' type, structured around lavender, oakmoss, and bergamot. Cool, fresh, and unisex. Eau de parfum strength. I never had a habit of wearing perfume until making my own, because of synthetics, which are ubiquitous in the perfume industry. Synthetics lend perfumes a heavy, jangly quality — they're the reason that perfume tends to smother an entire room and linger forever, and they're responsible for masking a person's own unique, delicious, human scent. Over the last decade I've found that synthetic perfumes make me feel physically ill as well, exacerbating my fibromyalgia, and I'm far from alone in this sensitivity. 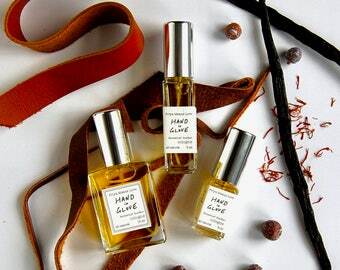 My perfumes are different — they are utterly all natural, made only from botanical essential oils, handmade tinctures, and absolutes, most of which are organic or wildharvested, in a base of grain alcohol or organic jojoba oil. 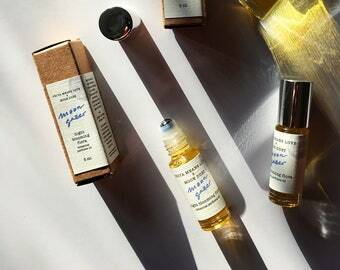 No synthetic fragrances, nitromusks, pthalates, or fillers — no synthetics, period, in keeping with everything I make. I aim to make true perfumes, complex blends that paint an olfactory picture, with lingering, close-to the skin base notes, fulsome heart notes, and effervescent head notes. Natural perfumes build on the ultimate base note of your own skin — they will smell different, and evolve differently, on each wearer. This perfume is rich in botanical ingredients, so if you have concerns about allergies, consider a patch test or speak to your doctor, and feel free to contact me if you have any concerns. 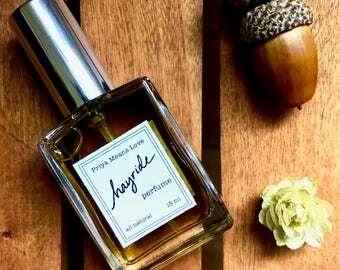 Unlike synthetic perfumes, natural perfumes unfold over time — initially you experience the head notes, then the heart, and over time the base notes linger on the skin for hours. I love this dynamic quality, how the scent is constantly evolving, never monotonous — and I like how this changing sensory input makes you take notice of the moments as they pass by. 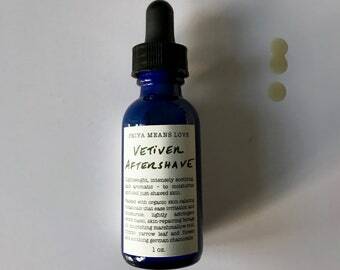 Because this perfume contains no synthetic fixatives, it will not linger as long as conventional perfumes — reapply every few hours, or as you please, as an olfactory ritual, rooting you in the present moment. 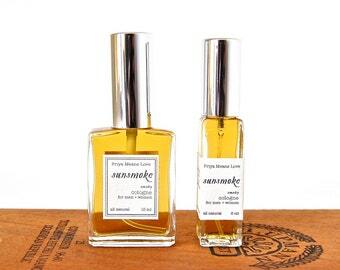 I make these perfumes with a sense of wonder and reverence for the magic of aromatic plants. I hope you feel a sense of wonder and beauty wearing it. smells so good and really potent. a little goes a long way! Due to the personal nature of my products, I'm unable to accept returns. That said, if you've received an item you believe to be defective, or if for any reason you are unsatisfied with your order, please let me know right away, and we will work together to find a solution! When you place your order, you'll see a "ship by" date. Should you need your order sooner, just let me know -- I can often ship orders sooner on request! Your order will be packed in eco-friendly materials: recycled boxes and mailers, recycled GreenWrap, and/or reused bubble wrap. I ship via insured USPS. If you'd like additional services like signature confirmation at an additional cost, please let me know. IMPORTANT: if your delivery location is prone to theft, please either let me know, or request signature confirmation. Do your products contain petroleum products, synthetic fragrances, fragrance oils, parabens, formaldehyde releasers, or other synthetic preservatives? No, never -- this is very important to me. My passion, which became my business, stems from my reverence for natural, minimally processed beautiful materials, and from my own profound chemical sensitivities -- so you can be sure that my none of my products will ever contain these sorts of materials. My products are truly, radically all natural. What do you mean by radically all natural? That's a tough question to answer in a short space. But, in essence: there's no standard definition for what "all natural" means in the bodycare and cosmetic world. * Different people have different definitions, and I often see products labeled "all natural" that contain dubious ingredients. What I mean by radically all natural is that every single ingredient I use would fit anyone's notion of what it is to be natural. My products are made from simple, elemental, minimally processed ingredients like herbs, clays, essential oils, oils, and beeswax. Good, clean food, basically! *In fact "all natural" isn't a regulated term, and any company can call their products natural, even if they contain synthetic fragrances, preservatives, etc.! Given that your products are all natural, how long do they last? Quite a while! Typically 1-3 years. I formulate my products to be enjoyed over time, and each product is labeled with its batch number and with an "enjoy by" date. The shelf life depends on the particular oils in the product -- just as you wouldn't cook with olive oil that's a few years old, so also will the natural oils in bodycare go rancid over time. If you get to the end of the stated shelf life and your product still feels and smell fresh (no gumminess to a balm, no whiff of old oil), feel free to keep using it! I am pretty conservative when stating shelf life, so products typically last months longer than indicated. How should I store and care for my Priya Means Love products? A few places to *avoid* storing your goodies: in a car (big temperature swings! ), on top of a radiator, on a sunny windowsill. Because my products are made from natural oils, butters, and waxes, they may become softer in very hot weather or harder in cold weather. These texture variations are normal and won't affect the performance of the product. Notes on allergies and medical conditions. 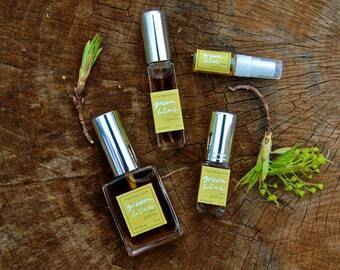 My products are rich in botanicals, which speak to our bodies in complex, profound ways. But with plants, allergies are always a possibility. Please read ingredients lists, know your own allergies, and ask questions; when in doubt consult your doctor and/or do a patch test. All the descriptions of my products and ingredients are for educational purposes only. Are your products cruelty free? Vegan? My products are cruelty free and always will be. I am personally against animal testing, and I will never test my products on animals. To be cruelty-free, a company's ingredients must not be tested on animals either. Part of the reason I use simple, natural ingredients with a long history of human use is that they sidestep the supposed "need" for animal testing, because they're already known to be safe. My products are all vegetarian (like me! ), and many are naturally vegan. The only non-vegan ingredients I use are beeswax from local farmers who use good bee-friendly practices, natural lanolin (extracted from sheared sheep's wool), and powdered milk. Many of my products can be made vegan on request -- feel free to convo me! I try to avoid bringing more packaging into this world! Most of my glass packaging can be returned to me for a refund of $1 per piece. Unfortunately I'm unable to cover shipping expenses, so I recommend saving up a handful of containers before mailing your glass packaging back to me. Convo me for my shipping address; when I receive your packaging, I'll issue you a refund on a previous order or via PayPal. I often vend at markets in the Baltimore/DC/Philadelphia area -- if you live in the area, you're welcome to return packaging to me in person! A few years ago I bought a lip scrub / perfume / body butter from you that I LOVED and it's no longer in your shop -- do you have more, or can you make another for me? Quite possibly! Feel free to email me to ask -- you never know! Where can I smell and feel your products in person? Do you offer wholesale? 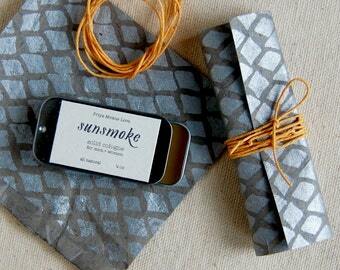 WHOLESALE INQUIRIES: Have a beautiful shop where my organic products would fit in? Please contact me at priyameanslove at gmail, or find me on Etsy Wholesale! Who makes all this stuff? Where? All of my products are handmade from scratch by me! I formulate and handmake everything in my Baltimore workshop, using only radically all natural, minimally processed ingredients, most of which are organic or wildharvested. I aim to make my products as from-scratch as possible, starting with herbs, some of which I grow, wildharvest, or source from a nearby farm. 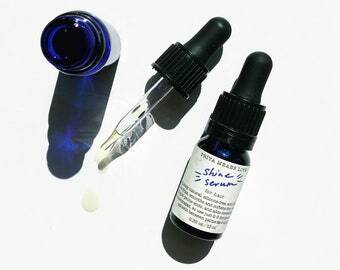 My workshop is always brimming with herbs infusing in oils and tinctures brewing, raw materials that will end up in my Deep Radiance Face Cream, Balsam Fir Deodorant, Lavender Mud shampoo -- you name it!